Steven Campbell was best known for his large figurative paintings and is among the most well-known Scottish artists of his time. Born in 1953 in Glasgow, Steven Steven graduated from the Painting Department of Glasgow School of Art in 1982, winning the Bram Stoker Gold Medal. He was awarded a Fulbright Scholarship and travelled to study at the Pratt Institute in New York in 1982. 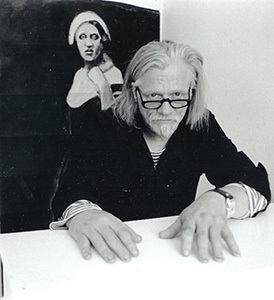 Steven exhibited extensively and his work is in numerous public collections including: the National Gallery of Scotland, the Tate Gallery, London, the Walker Art Centre, Minneapolis, USA. Steven emerged as one of the young Glasgow school of artists and his international reputation was established while working in New York in the mid ’80s. His highly original paintings evolved from an eclectic range of personal and literary sources creating narrative paintings, which provided surreal and trenchant comment on man in the modern world. Steven Campbell died August 15 2007. Copyright. All works on this website © Carol Campbell and may not be reproduced without permission. Unauthorized use and/or duplication of this material without express and written permission from Carol Campbell is strictly prohibited. Excerpts and links may be used, provided that full and clear credit is given to The Steven Campbell Trust and thestevencampbelltrust.org 2015, with appropriate and specific direction to the original content. Art, London. Catalogue introduction by Duncan Macmillan.